The Tyrone defence apply the pressure on Cork's Luke Connolly. 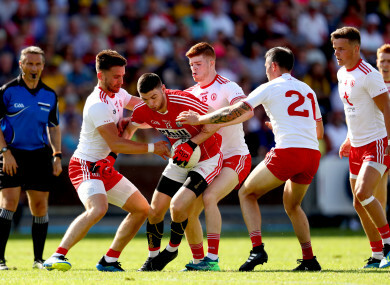 ANOTHER QUALIFIER RUN has successfully concluded for Tyrone after they eased past Cork in today’s Round 4 qualifier and propelled themselves towards a coveted berth in the Super 8s. Mickey Harte watched his side dismantle Cork in the second half. They had gone in at half-time in front 0-10 to 0-5 and accelerated clear upon the resumption as they picked off a pair of goals to kill off the contest. Tyrone struck a decisive blow in the 42nd minute when they turned over a Cork kickout, countered quickly and Conor McAliskey stepped inside the cover to drill home a goal. That pushed Tyrone clear by 1-13 to 0-6 and when Ronan O’Neill palmed to the net in the 52nd minute for their second goal, moments after he had been introduced to the action, it ended the contest. It was another dispiriting experience for Cork. They trailed 0-4 to 0-1 after 15 minutes before enjoying their best spell with three points on the bounce from Ruairi Deane, Michael Hurley and a pointed free from Luke Connolly to draw level. That was as promising as it got and they were grateful to goalkeeper Mark White for a couple of smart saves in the early stages of the first half. The class of Peter Harte helped Tyrone get on top and the scores flowed in the second half. They bagged a third goal late on when substitute Mark Bradley calmly rolled a shot to the net and Cork’s woes were compounded wen Mark Collins was sent-off late on. Scorers for Tyrone: Connor McAliskey 1-6 (0-4f), Ronan O’Neill 1-2 (0-2f), Mark Bradley 1-0, Frank Burns, Cathal McShane 0-3 each, Niall Sludden 0-2, Peter Harte (0-1f), Colm Cavanagh, Matthew Donnelly, Richard Donnelly 0-1 each. Scorers for Cork: Luke Connolly 0-9 (0-6f, 0-1 ’45), Mark Collins 0-2, Ruairi Deane, Michael Hurley 0-1 each. Who’ll fall at the last Super 8s hurdle, can Kildare back-up Newbridge and will Cork show up? Email “McAliskey, O'Neill and Bradley goals help Tyrone power past 14-man Cork”. Feedback on “McAliskey, O'Neill and Bradley goals help Tyrone power past 14-man Cork”.